Bill & Coo, a Leading Hotels of The World Member, is ‘the hotel’ for those seeking bespoke luxury and seclusion. Located in Agios Ioannis (the outskirts of the Mykonos Town), this getaway is a calm, beachside boutique hotel that offers 32 sumptuously designed suites. Bill & Coo’s look and feel is characterised by soothing, elegant off-white, gray and cream palettes coupled with Mykonian accents. At the property, you won’t want to leave the seductive pool area and lounge bar, where you can indulge all day in Ouzo mojitos. This picturesque luxury accommodation is recognised for its sophisticated ambiance and top-of-the-line service that includes a stellar concierge, which can arrange private jet services, yachting and sailing excursions. Make sure not to miss the excellent dining experiences that range from the award-winning Bill & Coo’s Gourmet Restaurant to Beefbar Mykonos, a high-end steakhouse. Bill & Coo is the ideal choice for discerning couples seeking a romantic, private getaway. Santa Marina, built on a secluded beach in tranquil Ornos Bay, is the only resort in Mykonos that features a private beach for its guests. Mykonos’ iconic Santa Marina property has been recently expanded, and today accommodates 101 expansive rooms and suites. Santa Marina’s popularity can be attributed to its cosmopolitan vibe and sleek design embodied by contemporary furniture and bamboo features, a mesmerising infinity-edge saltwater pool (at the Oasis Pool & Lounge). Pampering is taken seriously here with unparalleled concierge services that can arrange luxurious helicopter transfers on demand. Lastly, take advantage of the legendary Buddha Bar Beach restaurant, one of the world’s best beach clubs and most sought-after restaurants on the island. Buddha Bar affords stunning views of the hotel's beach and is decorated with Asian-inspired accents. Here, you can savour mouth-watering sushi and tantalising cocktails while Celebrity DJs spin beach beats. The Santa Marina is suitable for both couples and families, as children have a separate play area and kids' pool. Is This Europe's Most Luxurious Resort? 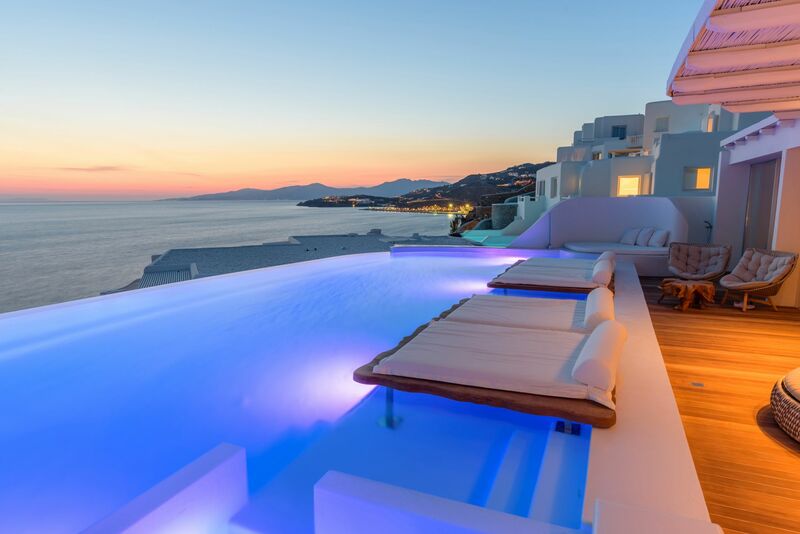 Katikies Mykonos, a Leading Hotels of The World member, is located in the serene peninsula of Agios Ioannis. Having just opened in June 2018, it accommodates 35 exclusive suites, most of which feature private plunge pools overlooking the Aegean Sea. The hotel features three restaurants including the swank Seltz champagne bar, a rejuvenating spa called ‘A.Spa’, and a highly exclusive concierge service that is available 24 hours from anywhere on the island. The inspiration behind the property’s bohemian, chic design is intended to draw you out toward the ocean, and so the decor magically blends fresh blue-and-white hues with elegant furnishings. Guests flock to this retreat to escape Mykonos’ party madness and experience a relaxed ‘barefoot vibe’. Even the hotel’s gourmet Mikrasia restaurant offers a ‘toes-in-the-sand’ culinary experience. Kenshō Boutique Hotel & Suites, which was recently awarded ‘World Best New Boutique Hotel’, is a five-star boutique hotel situated at the top of a hill above the quaint Ornos beach (a few minutes’ drive away from Mykonos Town). The resort opened in the summer of 2016 and today accommodates 35 luxurious suites. Kenshō took the traditional Cycladic decor and revamped it by integrating minimalist, sleek design that embraces elements such as copper light fittings, stone floors and blonde wood. We especially love the stylish pool area, which is decorated with olive trees and studded with sparkling lights in the evenings, as well as the diverse, exclusive corners offered at Kenshō (ranging from the swinging chairs near the breakfast area to the engulfing mushroom-shaped lights) granting guests the utmost privacy. The fine-dining restaurant headed by Chef George Stylianoudakis, where he offers a refreshing spin on Greek fine dining, is one of the island’s best kept secrets as even non-hotel guests wait patiently on the waiting list. Lastly, don’t forget to indulge in the heavenly Hermès bath soaps! This slice of minimalistic paradise attracts beautiful clientele including bloggers and celebrities, and is highly suitable for a couple’s retreat. The Cavo Tagoo Mykonos, famous for its iconic infinity pool and floating sunbathing lounge areas, is among the most fashionable and Instagrammed hotels in Mykonos. The hotel, which is perched on a cliff-side that perfectly blends in with its natural rock surroundings, is in close proximity to beaches near Hóra. Cavo Tagoo encompasses 80 stylish rooms, all of which are furnished with a private plunge pool that grants unmatched views of the Aegean Sea. The property stands alone as an incredible balance between minimalistic design and a relaxed ambiance, and distinguished world-class service. The awe-inspiring pool, superb 40-metre aquarium bar and Japanese restaurant are a few of the many factors contributing to the property’s popularity among a young and stylish clientele. Put simply, it is the ‘place to be’ and ‘to be seen’ in Mykonos. At the Cavo Tagoo you can soak all day at the ultra-stylish pool are while sipping Greek rosé. During your next visit at the Cavo Tagoo, make sure to look out for regular celebrity visitors such as supermodel Izabel Goulart, Lindsay Lohan and Pretty Little Liars’ star Shay Mitchell.